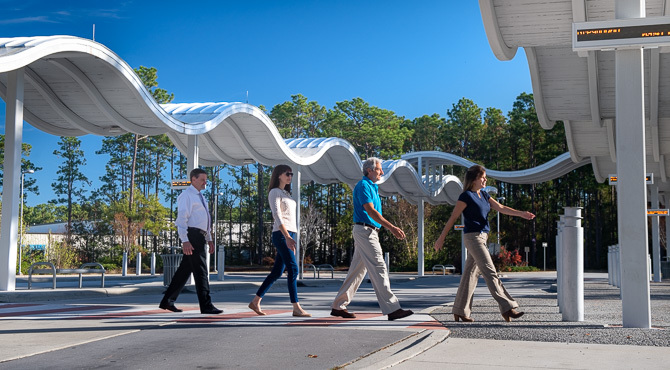 Albert Eby ’06M; Vanessa Lacer ’11, ’14M; Megan Matheny ’12; and Joseph Mininni ’98M play a vital role in getting New Hanover County residents to their jobs, medical appointments, school and out of harm’s way during emergency evacuations. These Seahawks are leaders within Wave Transit Authority, which provided transportation to more than 1.4 million passengers in fiscal year 2017. Eby serves as the authority’s executive director; Matheny is the deputy director; Mininni is the director of finance and administration; and Lacer is the mobility manager. Hurricane Florence was a moving experience for Eby, he said. Seeing families and individuals having to experience the tragedy of evacuating their homes and spending significant time in shelters was difficult. “The storm opened my eyes to the crisis of affordable housing in New Hanover County. I hope to use my experience and knowledge to work toward solutions to improve affordable housing in the region,” said Eby, an active volunteer with Cape Fear Habitat for Humanity. Eby’s partnership with the university over the past 17 years and his time as a graduate student in the Master of Public Administration program have allowed him to build relationships with administrators, professors and students who share his passion for building a strong community. In 2013, he was named the M.P.A. program’s alumnus of the year for his efforts to offer internships to students and hire recent graduates. “We have hired several recent Seahawks, and many of them have risen to the highest ranks of the authority,” he said. Joseph Mininni’s job is to balance the needs and wants of the community with the financial resources available. “It is not always an easy job having to say no, but the real thrill comes from making it all work out in the end by helping my community get around,” he said, noting that the greatest reward of the job is working with the team to address many issues that arise within the organization and the community. Vanessa Lacer connects senior citizens, individuals with disabilities and the general public to transportation services through the Wave Connect Program. Lacer, who earned her bachelor’s degree and a Master of Public Administration from UNCW, said the university prepared her for the day-to-day job requirements of her career through coursework and applied learning opportunities. Additionally, the faculty and alumni networks were instrumental in internship placements at local nonprofits and apprenticeship placement with NCDOT, which led her to Wave Transit.